Columbia County, near Rainier, Oregon, U.S.
After only 16 years of service, the plant was closed in 1992 by its operator, Portland General Electric (PGE), after cracks were discovered in the steam-generator tubing. Decommissioning and demolition of the plant began the following year and was completed in 2006. While operating, Trojan represented more than 12% of the electrical generation capacity of Oregon. The site lies about twelve miles (20 km) north of St. Helens, on the west (south) bank of the Columbia River. Construction began on February 1, 1970; first criticality was achieved on December 15, 1975, and grid connection eight days later on December 23. Commercial operation began on May 20, 1976, under a 35-year license to expire in 2011. At the time, the single 1130 megawatt unit at Trojan was the world’s largest pressurized water reactor. It cost $460 million to build the plant. Environmental opposition dogged Trojan from its inception, and the opposition included non-violent protests organized by the Trojan Decommissioning Alliance. Direct action protests were held at the plant in 1977 and 1978, resulting in hundreds of arrests. 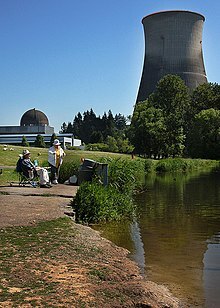 Two people fishing near the Trojan Nuclear Power Plant. The reactor dome is visible on the left, and the massive cooling tower on the right. In 1978, the plant went offline on March 17 for routine refueling and was idle for nine months while modifications were made to improve its resistance to earthquakes. This followed the discovery of both major building construction errors and the close proximity of a previously unknown fault. The operators sued the builders, and an undisclosed out-of-court settlement was eventually reached. The Trojan steam generators were designed to last the life of the plant, but it was only four years before premature cracking of the steam tubes was observed. In October 1979, the plant was shut down through the end of the year for repairs. In the 1980 election, a ballot measure to ban construction of further nuclear power plants in the state without federally approved waste facilities was approved by the voters 608,412 (53.2%) to 535,049 (46.8%). In 1986, a ballot measure initiated by Lloyd Marbet for immediate closure of the Trojan plant failed 35.7% yes to 64.3% no. This proposal was resubmitted in 1990, and again in 1992 when a similar proposal (by Jerry and Marilyn Wilson) to close the plant was also included. Each measure was soundly defeated by vote margins over 210,000 votes. Although all closure proposals were defeated, the plant operators committed to successively earlier closure dates for the plant. The demolition of the 499-foot (152 m) cooling tower at 7:00 am on May 21, 2006. In 1992, PGE spent $4.5 million to successfully defeat ballot measures seeking to close Trojan immediately, rather than within four years, as PGE had planned. At the time, it was the most expensive ballot measure campaign in Oregon history. A week after the election, the Trojan plant suffered another steam generator tube leak of radioactive water, and was shut down. It was announced that replacement of the steam generators would be necessary. In December 1992, documents were leaked from the U.S. Nuclear Regulatory Commission showing that staff scientists believed that Trojan might be unsafe to operate. In early January 1993, PGE chief executive Ken Harrison announced the company would not try to restart Trojan. The spent fuel was transferred from cooling pools to 34 concrete and steel storage casks in 2003. In 2005, the reactor vessel and other radioactive equipment were removed from the Trojan plant, encased in concrete foam, shrink-wrapped, and transported intact by barge along the Columbia River to Hanford Nuclear Reservation in Washington, where it was buried in a pit and covered with 45 ft of gravel, which made it the first commercial reactor to be moved and buried whole. It was awaiting transport to the Yucca Mountain Repository until that project was canceled in 2009. The iconic 499-foot-tall (152 m) cooling tower, visible from Interstate 5 in Washington and U.S. Route 30 in Oregon, was demolished in 2006 via dynamite implosion at 7:00 a.m. PDT on Sunday, May 21. This event marked the first implosion of a cooling tower at a nuclear plant in the United States. Additional demolition work on the remaining structures continued through 2008. The central office building and the reactor building were demolished by Northwest Demolition and Dismantling in 2008. Remaining are five buildings: two warehouses, a small building on the river side, a guard shack, and offices outside the secured facility. It is expected that demolition of the plant will cost approximately $230,000,000. This cost includes the termination of the plant possession-only license, conventional demolition of the building and continuing cost for storage of used nuclear fuel. A number of the air raid sirens that were originally installed within a ten-mile (16 km) radius of Trojan, to warn of an incident at the plant that could endanger the general public, are still standing, in the towns of Longview, Washington, Kelso, Washington, and Kalama, Washington. Some of the other sirens, which have been removed, have been repurposed as tsunami warning sirens along the Oregon coast. While there are no plans to remove the remaining sirens, the city of Longview has removed a few of the sirens on an as-needed basis to make way for other projects. Trojan Heliport (FAA LID: 3OR7) was a 60 x 60 ft. (18 x 18 m) private turf heliport located at the power plant. It appears to be defunct at this time. ^ Thomas, Ryland; Williamson, Samuel H. (2019). “What Was the U.S. GDP Then?”. MeasuringWorth. Retrieved April 6, 2019. United States Gross Domestic Product deflator figures follow the Measuring Worth series. ^ “Nuclear power plant”. Spokesman-Review. Spokane, Washington. (photo). November 19, 1969. p. 6. ^ Koberstein, Paul (2005-03-09). “Trojan: PGE’s Nuclear Gamble”. Willamette Week. p. A1. Archived from the original on 2007-09-29. Retrieved 2007-06-15. ^ “Trojan Nuclear Plant Decommissioning Update” (PDF). Issues in Perspective. Portland General Electric. March 2006. Archived from the original (PDF) on November 14, 2007. Retrieved 2008-04-06. ^ “Trojan test successful, PGE says”. Eugene Register-Guard. (Oregon). UPI. May 20, 1976. p. 9A. ^ Daniel Pope. Anti-Nuclear Movement The Oregon Encyclopedia. ^ “Trojan plant OK, U.S. agency says”. Eugene Register-Guard. (Oregon). wire services. December 4, 1978. p. 1A. ^ “Five more protesters arrested in effort to shut down Trojan”. Eugene Register-Guard. (Oregon). Associated Press. October 17, 1979. p. 9B. ^ “Trojan nuclear plant operates at full capacity”. Eugene Register-Guard. (Oregon). UPI. January 2, 1980. p. 7A. ^ “Trojan nuke plant put on line again”. Lewiston Morning Tribune. (Idaho). Associated Press. January 2, 1980. p. 2B. ^ Oregon Blue Book. Initiative, Referendum and Recall: 1980-1987. November 4, 1980 – “Nuclear Plant Licensing Requires Voter Approval, Waste Disposal Facility Existence”. ^ Oregon Blue Book. Initiative, Referendum and Recall: 1980-1987. November 4, 1986 – “Prohibits Nuclear Power Plant Operation Until Permanent Waste Site Licensed”. ^ Oregon Blue Book. Initiative, Referendum and Recall: 1988-1995. November 6, 1990 – “Prohibits Trojan Operation Until Nuclear Waste, Cost, Earthquake Standards Met”. Defeated 40.3% yes, 59.6% no. ^ Oregon Blue Book. Initiative, Referendum and Recall: 1988-1995. November 3, 1992 – “Closes Trojan Until Nuclear Waste, Cost, Earthquake, Health Conditions Met”. Defeated 59.9% to 40.1%. ^ Oregon Blue Book. Initiative, Referendum and Recall: 1988-1995. November 3, 1992 – “Bans Trojan Power Operation Unless Earthquake, Waste Storage Conditions Met”. Failed 42.7% yes to 57.3% no. ^ “Anti-Nuclear Movement”. The Oregon Encyclopedia. ^ Esteve, Harry (November 4, 1992). “Oregon voters just said ‘no’ to measures”. Eugene Register-Guard. (Oregon). p. 5B. ^ Malkin, Whitnes (November 8, 2007). “Tax defeat costs big tobacco big bucks”. The Register-Guard. ^ a b “Split over N-plant safety revealed”. Eugene Register-Guard. (Oregon). Associated Press. December 20, 1992. p. 1A. ^ Esteve, Harry (January 5, 1993). “PGE shuts down Trojan for good”. Eugene Register-Guard. (Oregon). p. 1A. ^ Baum, Bob (January 5, 1993). “Oregon nuclear plant won’t reopen”. Lewiston Morning Tribune. (Idaho). Associated Press. p. 7A. ^ Esteve, Harry (January 6, 1993). “Trojan will have a slow, expensive death”. Eugene Register-Guard. (Oregon). p. 1A. ^ Havrelly, Wayne (March 18, 2011). “Trojan’s nuclear waste still on-site in steel, concrete casks”. Northwest Cable News. ^ “Trojan Nuclear Power Plant”. Center for Land Use Interpretation. Retrieved 2008-12-03. ^ “GAO: Death of Yucca Mountain Caused by Political Maneuvering”. New York Times. Aug 1, 2011. Retrieved 11 May 2011. ^ Harden, Blaine (May 22, 2006). “Nuclear tower takes volatile history with it”. Eugene Register-Guard. (Oregon). (Washington Post). p. A1. ^ Skidmore, Sarah (May 22, 2006). “Tower demolished at idle Oregon power plant”. Spokesman-Review. (Spokane, Washington). Associated Press. p. A6. ^ “Northwest Demolition and Dismantling”. Retrieved 1 Aug 2011. ^ “Trojan Nuclear Plant old sirens – Google My Maps”. Google My Maps. ^ News, The Daily. “News Photo: Siren down”. tdn.com.